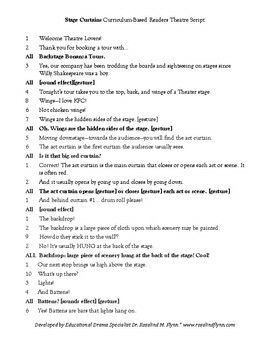 Using a tour guide context, this script provides a brief overview of information about these types of stage curtains and other stage terms: act curtain, backdrop, battens, border, curtain line, cyc, cyclorama, gauze, legs, proscenium, proscenium arch, scrim, teaser, tormentors, and travelers. 1. 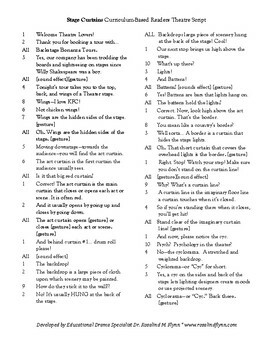 The 2-column 2-page complete script. 2. 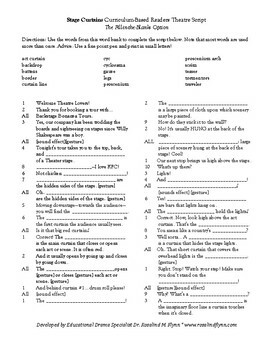 A 1-column version of the same complete script—for ease in reading when projected onto a screen. 3. A 2-column 2-page “fill-in-the blanks” version of the same script with a word bank to involve students in researching or recalling terms. Reading and rehearsing the script familiarizes students with some basic facts while also increasing reading fluency and engaging students in a dramatic approach to learning facts. The use of gestures (that the students themselves create) during the script reading reinforces the retention of information in a kinesthetic way that researchers call “embodied cognition” - When people see and use gestures, they activate more memory systems. Students enjoy creating and performing gestures and sound effects where indicated in the stage directions. And—because it is a script—they do not mind reading and re-reading the information. A fluent and expressive read-through/performance takes about 8 minutes. 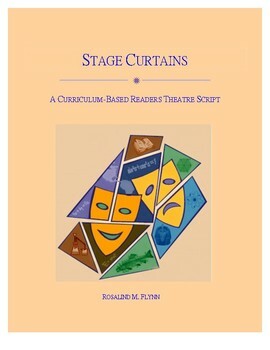 For more details and tips about using these scripts with students, you may want to download the FREE copy of "CURRICULUM-BASED READERS THEATRE: A Guide to the Classroom Use of this Strategy" available in my store.